The rapid drop in the pound's value since the Brexit vote — around 15% — will hinder rather than help British exports and the British economy, according to Deutsche Bank. David Folkerts-Landau, Deutsche Bank's chief economist, said in a note circulated on Friday that "international economics have evolved since the Victorian era" and as a result a fall in the pound won't automatically make British goods cheaper to overseas buyers. The note is a stern rebuttal to Brexit supporters such as former Tory Leadership contender Angela Leadsom who have argued that the weaker pound will actually boost Britain but encouraging exports. Folkers-Landau first notes that 45% of Britain's exports are services, which are typically price inelastic — people are more driven by the quality of the service than its price. 60% of services exported are finance and business related. "This is a problem, as relatively speaking financial and other business services exports are likely to be the worst hit by a less integrated relationship with the EU," Folkerts-Landau and his team write. What about manufacturing? "World trade no longer consists of final consumption goods being bartered for raw materials," he says. "Any economy’s manufacturing exports today contain a significant chunk of value that is added abroad." In other words, component parts central to manufacturing are often imported from abroad and those parts become more expensive when the pound drops. The UK specialises in exporting products that have many component parts — nearly 30% of its manufactured exports are machines, engines, vehicles, and aircraft. To benefit from the fall in the pound the profit margins on these exports would have to be able to absorb the big increase in import costs of raw materials. An economy which adds a lot of domestic value to exports, and depends less on foreign parts, could theoretically benefit from a currency drop. But the UK is not one of those economies. It adds only 64% domestic value to manufactured products. By contrast, Japan adds 82%, and the US adds 78%, according to the note from Deutsche Bank. 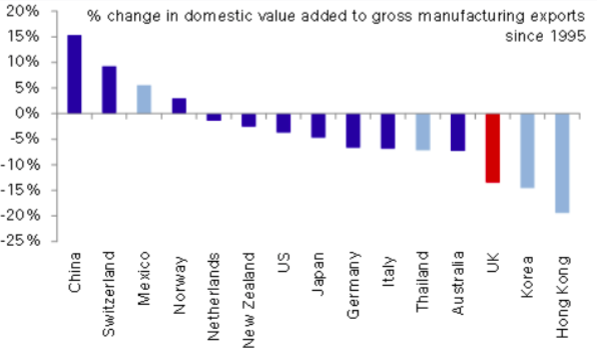 In fact, Britain is getting worse at adding domestic value to products, as it moves towards becoming an "assembly line" economy. Even if we ignore all these facts and assume the UK does manage to rebalance its economy towards being a manufacturing powerhouse, it's not clear they'll have much luck selling abroad. 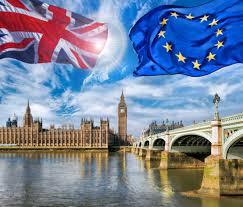 "The timing of Brexit is therefore unfortunate from a rebalancing perspective. The 1990s and first half of the 2000s were the golden age of globalization with global trade growing 400% over the period. Today, by contrast, the benefits of a free trade policy look less clear cut, and the UK may struggle to establish the free trade deals it needs to offset a loss of Single Market access."